Eddyr2 had the most liked content! Did the Servite fresh bear MD last year? Best OOS records ever . Top 10 Quarterbacks from Class of 2020 10. Malik Hornsby — Fort Bend Marshall (Missouri City, Texas) This gifted quarterback still isn't close to reaching his potential, which is scary because he is already one of the best players in the country. During his junior season he threw for nearly 2,000 yards and 23 touchdowns adding another 772 yards rushing to go with 13 scores. He helped Fort Bend Marshall to the UIL Texas 5A Division II state championship game and expect them to be in the hunt again in 2019. 9. Luke Doty — Myrtle Beach (Myrtle Beach, S.C.) The 2020 South Carolina commit was one of the biggest risers in the updated rankings released earlier this week on 247sports. The 4-star quarterback had a monster junior campaign throwing for over 3,000 yards and 36 touchdowns while leading Myrtle Beach to the South Carolina Class 4A state title. 8. Harrison Bailey — Marietta (Ga.) DeShaun Watson, Trevor Lawrence, Jake Fromm and Justin Fields are just some of the notable quarterbacks to come from the state of Georgia. Marietta's Bailey is up next. The 2020 Tennessee commit has one of the country's best arms and has lit up defenses ever since his freshman season while playing against the best competition in the Peach State. 7. Hudson Card — Lake Travis (Austin, Texas) Known for producing big-time quarterbacks, the Cavaliers' 2020 Texas commit proved he belongs in the upper echelon after a monster junior season. Card threw for more than 3,500 yards and tossed 50 touchdowns against four interceptions. He also ran for nearly 700 yards and nine touchdowns. 6. Jack Miller — Chaparral (Scottsdale, Ariz.) The next great quarterback to come from Arizona is the 2020 Ohio State commit. He already punched his ticket to the Elite 11 finals later this summer and in eight games last season he threw for nearly 2,500 yards and 27 touchdowns. 5. Carson Beck — Mandarin (Jacksonville, Fla.) One of the biggest movers in the updated rankings and for good reason. The former Alabama commit threw for 3,500 yards and 39 touchdowns while leading the Mustangs to the school's first football state title. 4. Jay Butterfield — Liberty (Brentwood, Calif.) The first of three quarterbacks from California on the Top 10 list, the talented gunslinger led the Lions to a CIF Division 1-A state title with the only loss of the season came against No. 9 De La Salle (Concord). Butterfield finished his junior campaign with nearly 3,500 yards passing and 43 touchdowns. 3. Ja'Quinden Jackson — Duncanville (Texas) Texas' third and final offering is one of the most dynamic playmakers in the country. Jackson could easily be a 5-star wide receiver, but he is at the right position lining up under center, finishing his junior season with over 1,500 yards passing and 1,500 yards rushing to go with 38 total touchdowns. The impressive thing was Jackson played bigger in the biggest moments. He had 496 combined yards of total offense against Duncanville's two toughest opponents (Allen and North Shore) in the 6A Division I postseason. 2. Bryce Young — Mater Dei (Santa Ana, Calif.) No player had bigger shoes to fill last season than Young, replacing not just the Gatorade National Football Player of the Year but arguably the best quarterback in state history — JT Daniels. He showed he was ready for the moment, evident in the Monarchs' 28-24 win over national power IMG Academy (Bradenton, Fla.). He led a flawless nine-play, 75-yard drive in the final three minutes and scored the game-winning touchdown from five yards out with a minute left. 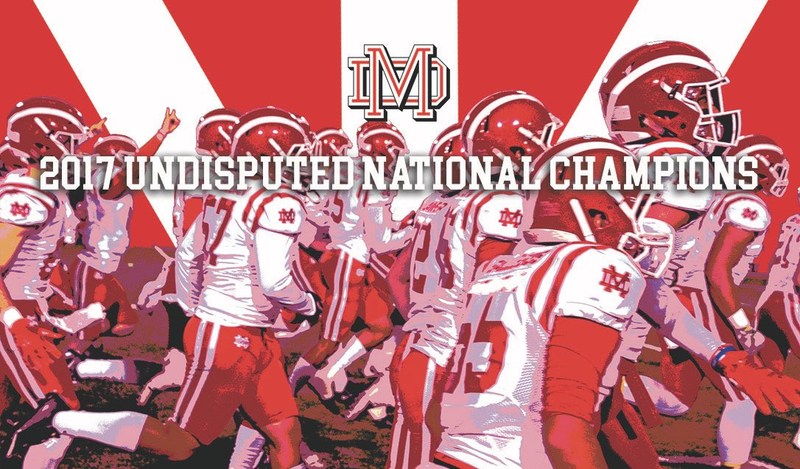 The 2020 USC commit led Mater Dei to its second straight CIF Open Division state title and threw for nearly 4,000 yards and 39 touchdowns while completing 70 percent of his passes in 2018. 1. DJ Uiagalelei — St. John Bosco (Bellflower, Calif.) The California Gatorade Player of the Year threw for over 3,300 yards and 48 touchdowns while completing 70 percent of his passes during his junior season. The 6-foot-4, 240-pounder has all the tools to be one of the best quarterback prospects of all-time and is the No. 1 rated QB for good reason. He checks in as the No. 6 overall recruit from the Class of 2020 and there's a good chance he finishes his senior season as the top recruit. The scary thing is he might be even better at baseball. He's one of the top pitching prospects and don't be surprised when he follows Kyler Murray as being a first-round selection in both professional sports. no deflecting. i love Coach Logan and all he does at Cen10. he is a great former and future Monarch!